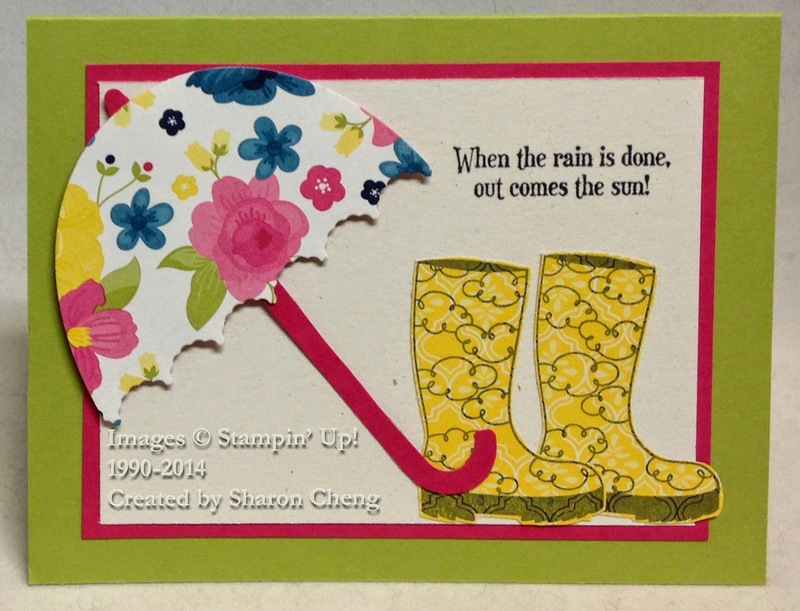 This Rainy Day card featuring Stampin' Up! 's Bootiful Occasions stamp set is easy to make thanks to using the Big Shot and punches. While I had been wanting to make a card using the rainboots, it took me some time to figure out how to make a quick and easy umbrella. You can see from the photo tutorial how to use the Ovals Collection Framelits and the Adorning Accents Edgelits to make the canopy part of the umbrella. Did you know that the Adorning Accents Edgelits is on sale through April 21st when Stampin' Up! is offering free shipping? It was the handle, pole and finial parts of the umbrella that stumped me for a few days. I tried several different things and even ended up tracing and cutting out umbrella parts. While it was doable, it certainly wasn't quick and easy. Then it dawned on me how to make the curved handle using the word window punch and the small oval. The finial was easy using the mosaic punch. The video shows you the different steps for making the umbrella. There is also a bonus technique in the video showing you how to cut out the rainboots easily and with clean edges. Enjoy making this Rainy Day card. Visit my online store to get your supplies for your project. Remember that when you purchase $25 or more in product, you are eligible for my Rewards Program.